In a large bowl, sift together the flour, sugar, baking powder, and salt. In a smaller bowl, combine the egg, milk, and melted butter. Blend the wet ingredients into the dry ingredients, mixing until the batter is almost smooth. Let the batter sit for 10 minutes. 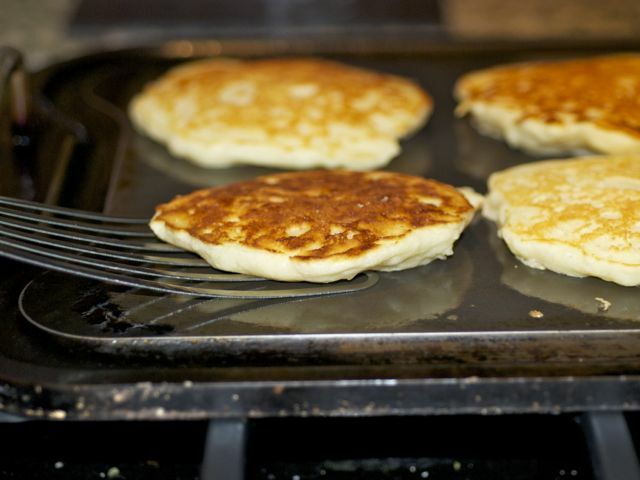 Heat a frying pan (cast iron works well) or griddle on medium-high heat. Grease the pan lightly with butter or a neutral vegetable oil. Use about ¼ cup of batter for each pancake, and do not crowd the pan. Fry each pancake until its surface is covered with bubbles. Flip and fry the other side for 1 to 2 minutes, until golden brown. Repeat until all the batter is gone. You can substitute cream for the milk for a richer pancake, or buttermilk for a tangier version. If the batter gets too thick, add a little extra milk.